Two very good memoirs have been published by chefs I admire and whose food I have eaten many times with great satisfaction, though the experiences are wildly different. Gabrielle Hamilton, chef of Prune has published Blood, Bones and Butter, which I reviewed for The Wall Street Journal. It was preceded by a much talked about, high-six-figure advance, which had to be returned when Hamilton failed to deliver, after which the book was repurchased and published last month. It’s a fabulous read by a very odd creature who has a visceral love of the homey food she serves at her restaurant. Frankly, it’s exactly the kind of food I love most, personally, braises and bone marrow and offal. It’s the kind of food that chef’s love to eat when they get off work. She cooks the kind of food she personally loves to eat and these kinds of chefs seem to be in the vanguard now: April Bloomfield at The Breslin and Spotted Pig, Paul Kahan at Publican, David Chang at Momofuku Ssam Bar, Jonathon Sawyer at The Greenhouse Tavern here in Cleveland. All of them no doubt have books in them, but none of them likely can write like Hamilton, who has actually studied writing and is truly gifted. On the opposite side of the cooking spectrum is Grant Achatz at Alinea, in Chicago, which serves Modernist cuisine, inventive playful dishes that require explanations about how to eat them, food that doesn’t always look like the food it’s pretending to be. At Trio, he created a pizza that was in fact a little square of edible paper. flavored with pepperoni and mozzarella; the shirmp cocktail arrived in a little spritzer and you tasted it as if you were using a breath freshener. Flavored exactly like a shrimp cocktail. Made you smile, made you scratch your head. This kind of wild innovation came of age when he opened Alinea with Trio regular Nick Kokonas, a Chicago businessman, where Achatz honed and polished the dishes to earn Michelin stars, immediate coverage in The New York Times, regular postings in top ten lists of the world’s best restaurant, and the number one restaurant in America according to Gourmet magazine. I first met Grant while working on The French Laundry Cookbook, wrote about him briefly in Soul of a Chef, devoted a lengthy chapter to him in The Reach of a Chef. I wrote the intro to his cookbook, Alinea. He’s a friend, as is Kokonas. So this can hardly be considered an unbiased appraisal of the book. But keep in mind that neither Grant nor Nick asked me to write about it, and frankly if I thought the book sucked, I wouldn’t write about it at all. 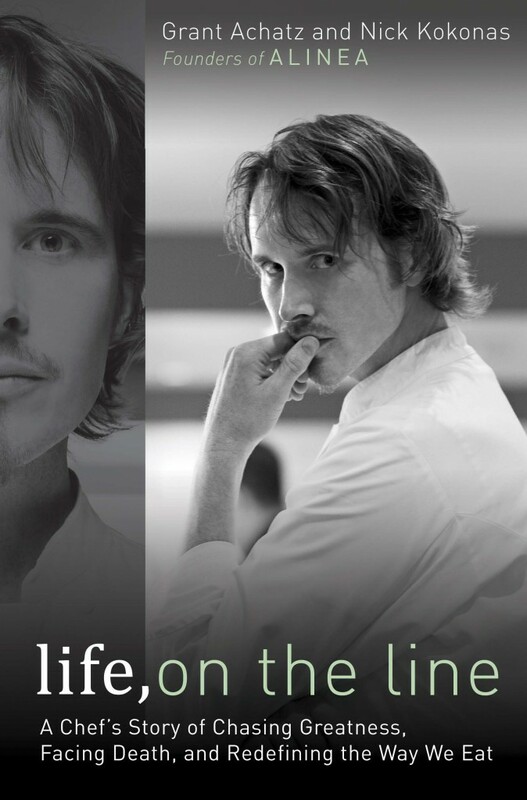 Life On the Line is Achatz’s autobiography written as joint venture between Achatz and Kokonas. After service at Alinea, Achatz would send Kokonas 2000 word emails on various parts of his life, and Kokonas would rewrite and expand them and give them structure; Grant would read and rewrite, expand on some of Nick’s passages. This back and forth voice, mainly first person from Achatz’s vantage, but sometimes from Kokonas’s, printed in a different font, is a risky and difficult strategy; while it can feel a little clunky at times, ultimately it works because the two are able to convey important but differing information and perspectives an in intimate first person way, such as Kokonas’s nut and bolts description of opening a restaurant and the personal trauma of watching his business partner and friend diagnosed with advanced tongue cancer that most docs said would likely kill him—but only after they removed his tongue and part of face. Life On the Line recounts Achatz’s life from his upbringing in St. Clair, Michigan, where he worked at the family restaurant from the age of five, through his training at the French Laundry, the revelatory but only days-long stage at El Bulli, to convincing Trio’s owner to allow him to experiment with Modernist cuisine, a marriage resulting in two kids and a divorce, through the opening of Alinea. The final section of this book recounts his cancer, the experimental treatment that saved his tongue and his life, and it is harrowing. Even people close to Grant, then in his early 30s, had no idea what he was going through, and his will is astonishing. It was the will of a young cook who wants to reach the top of his profession. I wondered at times had he not been a cook with such drive and determination for all these years, would he have had the stamina to endure the radiation required to kill the cancer (he narrated to Kokonas the Alinea cookbook during hours of chemo; throughout the entire treatment, he rarely missed a service). This is a book for all young chefs to read and anyone interested in the profession of cooking. It also describes in blunt and open detail how Alinea opened, information about finding investors, how much it cost, and how Kokonas maneuvered through the city codes to open on time. If there’s a fault in the prose, it’s that both Achatz and Kokonas can come off as a little cocky, bragging too much. That’s kind of Kokonas’s style, but frankly the guy walks the walk, too, as does Achatz; they have succeeded at every goal, and then some; you can’t say they haven’t earned it. If there’s an omision readers may find disappointing, it’s that Achatz talks so little about the actual food, its evolution and how he comes up with this crazy stuff. This didn’t bother me because, the subject ultimately disappoints: what can be described is common sense, and the mechanisms of the creative mind, how imagination works, how innovations are generated from within are very hard to get at. I’m glad he didn’t bog down in the creative process, which almost always comes off as self-important or pretentious. (The video below is Achatz’s description of how he arrives at flavor pairings, it’s excellent and all you really need to know. If you want more details on how the food is actually created, buy the Alinea cookbook and also invest in Modernist Cuisine, the awe-inspiring new multi-volume cookbook and manifesto detailing its every aspect). While Life On the Line lacks the artfulness of the Hamilton memoir, it’s nonetheless straightforward, clear, and compelling. In a world where chef-memoirs are becoming increasingly common, this is an uncommon one, by an uncommon chef and his innovative business partner, a valuable and captivating addition to the literature of gastronomy. True to the Modernist dictum—”Make it new”—the two have just opened the restaurant Next; if the opening night video (by Christian Seel, the restaurant’s in-house videographer) is any indication, it’s going to be dazzling. The facebook fan page for Next. I read Life, On the Line soon after it came out, and loved it. I guess I didn’t realize the omission of Grant’s creative process, and I agree that it would have been a great addition to the book. What I loved about Grant’s prose, is the balance of humility and pride in the particular stories he chose to tell. It made for a really beautiful and inspiring story, and was really hard to come out of that fog for a couple of days after I finished reading. I’m still intrigued by the contrasts between chefs such as these. The Hamiltons and their heartful cooking, which feeds off their bodies and experience, mediating little for the eater. The Achatzs and their baroque refinements, which separate from the sweat of their makers to feed in a cerebral way. I’m drawn to the Hamiltons, and was all ready to buy her book after the first half of your WSJ review… but then you gave away the ending! And what an ending!! I like my romantics to finish with a sweet pudding generally, but perhaps I’ll make my own in readiness for the final third. Facing Death? Really? No offense; have been in the medical profession for over 20 years and have faced it with many nameless folks. Chef Achatz is a hero of mine. A little humility might be a good thing…Folks, we are cooking, not curing cancer. Alice, the guy had stage four Squamous Cell Carcinoma, and was understandably … perturbed. Couldn’t you muster just a little sympathy? Alice, I worked for years with women and their children who were victims of domestic violence and never once in my entire career did I ever condemn them or query why they would choose to go back. As a health worker why do you not give praise when any man has survived a cancer? I, for one, am looking forward to reading this book. Having undergone treatment for breast cancer myself…I am doubly impressed that he was able to continue to work during treatment. That takes passion and dedication. Chemo and radiation have a way of making food taste and smell off, that he continued to make great food is nothing short of amazing. I have the greatest respect for Achatz; what he’;s done, what he’s overcome and what he’s doing now. But one thing the book lacked was “passion.” I assume he has it but that was not on display in his writing. Oddly, other reviews I have read state that the book is so full of Grant’s passion that it makes you want to run out and accomplish something huge yourself. I haven’t read it yet, so I can’t offer my own opinion. Either way, it’s possible that his impact on the culinary world has more to do with precision, control, perfection, and extremely high standards of execution. Sometimes passion manifests itself in less obvious ways. With all I have had to date in my life and its experiences I can’t even begin to contemplate or understand the luck, the strength, the stamina to not only go through his chemo and radiation but to also run his half of a successful business whose daily success relied on his shoulders alone. One says if something really bad happens on all levels it is a perfect storm but what is it called when everything is in your way towards disaster and yet you live to tell. If ever one could ask what was I put on this earth for it is this man. The irony is almost not believable. Now is nouvelle cuisine passé or is nouvelle cusine the new Modernist? I’m with Alice on this one. Can’t anybody in the public eye these days go without letting the world know of every ailment. How about we just live our lives and everybody takes home a “Hero” trophy? Not all cancers are equal. i’d almost like not to respond to this, but, really, “small ailment”? Jay, this was a potentially maiming, killing ailment. Not small. Consider the relevance, Jay. The doctor’s wanted to cut out his tongue. What do you do for a living? Is your job an all-consuming love that you are dedicated to? Is their an ailment you could imagine that would rob you of the ability to do it in such an obviously symbolic as well as literal sense? Can you imagine an injury or illness that would not only leave you unable to do your job, but might also end your basic ability to comminicate and could actually kill you? Aside from being life-threatening, Grant’s illness was particularly compelling because of his place in the culinary world. I think it’s a story worth telling because it can inspire others to go for their dreams now, it reminds us that every day could be our last, and it shows us how strong we can be as people. These themes are timeless and time-honored in the long history of story telling, but by all means ignore it if it bores you. I agree, not all cancers are equal. Everything is just a head cold after Jay and Alice.-Not really an appropriate comment, but that softball was just hanging there. I enjoyed the post and appreciate Grantz artistry and his personal struggles. Obviously this is cooking at the highest level. My take away pearl of wisdom here is the “Food Bouncing” presentation. This is a very great technique that I will study and develop until it becomes second nature.. like Ratio is getting to be now. Keep up the great job Michael. I find it amazing and sad that society has gotten to such a place that we’re just like, shut up about your problems and talk about the food, what’s a little cancer, man up. I’m certain that it’s treated not as an overly cloying People magazine feature, but it would have been a glaring omission to anyone who knows Achatz’ work (who will likely be the majority of the readers) not to devote at least a little of the book to his dealing with a major illness while continuing to run the restaurant. While I have no intention of reading it (the phrase “Spritz-spritz, shrimp cocktail” from Ruhlman’s chapter mentioning Achatz is actually a running joke in my home, that type of cooking is just NMS), I think it’s awfully callous of people to be like eh, quit whining about your cancer, we only want to hear about food food food. The whole of ones life experiences make up who you are and who you continue to become, and that includes the bad things as well as the good things. Are they breeding people without the empathy bone now? Geez. Maybe you’re not the first to do this, Mr. Ruhlman, but I love it: “modernist cuisine” is an excellent replacement for the tainted, pretentious, and inaccurate phrase “molecular gastronomy.” Of course I’m aware of the cookbook by the same name, but I’ve just never heard someone use it to describe the food trend in general. I shall pass it on! Jesus Christ there’s some jaded folks hanging around here! The guy could have easily died, not to mention the cruel irony of tongue cancer. That’s like Beethoven going deaf. Is it that difficult to acknowledge? I went to El Bulli to try the Molecular stuff. Had a great time but found out I’m not interested in trying any more of it. As a chef, I’m really not interested in his food. As a role model, I don’t think you could find a better one. The New Yorker did a profile on Achatz a couple years ago. The whole cancer story and his survival and immense drive makes for a compelling story. I’m not even going to think about shrimp cocktail spritz since it’s definitely not my style but you gotta hand it to this guy big time. How about if you were a pianist and had your hand amputated? There are still pieces for one hand…but a chef who battles tongue cancer? I want to hear what makes this guy tick. Blood, Bones and Butter is now on my wishlist. I really am shocked at the lack of sympathy you people have for him. Seriously? He is a chef. His passion is food. He lost a good portion of his tongue and you can’t understand the gravity of that loss? Or the strength it took him to get back in the kitchen and keep going despite the fact that he couldn’t taste anything?!?!? I remember reading a couple years ago the (I think it was) Food and Wine article on him and his battle with cancer. It’s something out of Shakespearean tragedy. I hold him up there with Lance Armstrong battling (also stage 4) cancer then coming back to win the Tour de France. It’s inspiring. I read both the books and liked them. The primary thing here, of course, is the passion these chefs have for food and cooking. I cannot even imagine going to work, let alone as a chef, when you have cancer in your tongue. That only happens with great deication and extreme will power. I wonder if a lot of people criticizing his recovery from cancer ever had to face anything like that themselves. I dont really know what kind of person he really is, but what he has achieved is amazing. After having had about a week to absorb and ponder Life, On The Line, I consider it one of the best pieces of modern food writing I have encountered (joining the likes of your great, The Soul of a Chef). As you note Michael, it is not so much about the actual development of flavors or individual dishes. Rather, the book is about the development of concept, drive, and ethos. These tools allow Chef Achatz to overcome seemingly every obstacle in his path to become the superstar he is today. Mr. Kokonas displays these attributes as well in standing by Chef through it all, whether the challenge be financial, creative, or health related. I am very happy that I took the time to read this book, and am disappointed only in that it could not have gone on longer. Too bad Next is so hard to get into. I will have to settle for drinks at the Aviary until my number comes up for a ticket. I read the book before reading any reviews, and I still haven’t read any reviews. The book is a fantastic memoir of a young life with mentors who have imbued him with an ethic to leave no detail unexamined and to do what it takes to extend yourself beyond what you thought you were capable of. Ruhlman singled him out in his book “The Reach of a Chef” (or was it Soul?). I do have a question for Michael though. Is it ethically defensible to be a reviewer of a book to which you have contributed, e.g., a back cover blurb? I am not being accusatory, merely interested in how that was handled.